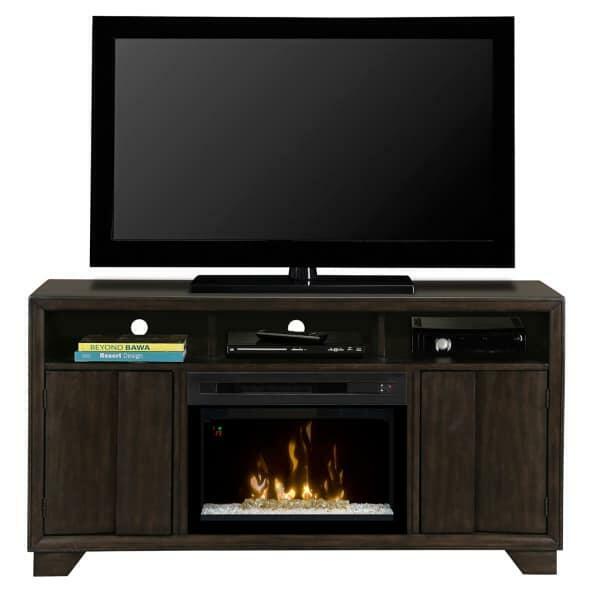 The Bayne media console is a two-in-one fireplace and entertainment station designed and crafted by fireplace experts Dimplex. Dimplex has over one hundred electric fireplaces to choose from, ranging from simple inserts to elaborate works of furniture. The Bayne sits closer to the latter grouping, with ample storage space and a surface built specifically to house your home’s favorite 55’’ flat screen television. The Bayne fireplace features the Biscayne faux flame technology that dances and twists and turns like genuine flames, but without all of the hassle of building, maintaining and cleaning up a fire. The Bayne even comes with the newest Dimplex advances in flame technology, with customizable flame effects that are easily adjusted with a convenient remote control. The flames do not emit heat, but the fan-forced heater does. Enjoy the coziness and all of the fanfare of a traditional fire, plus the storage and presentation of all of your media necessities.